Getting around Soho and the Westend can be difficult by car. Personally? I walk. An alternative option is to take a rickshaw. Ok slightly more expensive than a black cab, but hey loads of fun. Think of it as supporting the mostly foreign students trying to make their way in one of the most expensive cities in the world. I took one of those a few years ago. It was loads of fun! Never seen one of those in London. Next time I am there I'd like to try... if I can afford it. Teachers are rather poor down here in Italy! And don't forget the environment as well. Could be a good way to get some good photos. Just sitting there aiming the camera at everything you see. 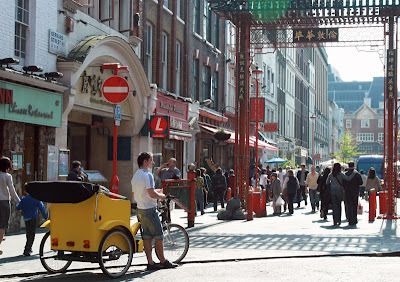 Why are there more English than Chinese walking around London Chinatown? I've been tempted but never had a go. I'd feel sorry for them doing all that peddaling! There would be a lot less homeless people in London if we strap a richshaw on each one of them. Don't you think? I had a go on a rickshaw after the ballet one night when I couldn't face the walk back to the station. My goodness it was hairy ! Soooooooo fast. Like being on a cycle but not in control. The ground in front of you, in the space between the driver and the cart, just flies by and there is nothing to grab onto - other than your partner of course !!! Great fun but FAST. And actually we haggled so we got if for the same price as a blck cab since there were so many of them hanging around the theatres. Brilliant, and as I say, speedy gonzales. seems like a great way to catch the city spots! A rickshaw is something I would never have thought London would have (unless it were in your Chinatown or something — which is what that red arch reminds me of). that yello three-cycle what's called in there? in my country it called "becak".. Very cool rickshaw, but I'm with you, I allways walk. I love rickshaws in London! I took one once with a friend and we had such a laugh! Don't remember how much we paid though. I'm sure it wasn't that much. Ciao. A.
I was in London last week-end and actually aw this "rickshaw" but I prefered walking which is a great way to enjoy the city. London is getting more and more one of my favourite cities.